Beauty In The Mirror: Hit the Road Jack! Well not literally! Ha ha Sorry about the title I couldn't think of anything else but thought road was appropriate seeings this post is featuring the travel sets by DIRTY WORKS. I know a few of us are off on our travels so hopefully this post will come in time but if not then these are still brill for when your on the go, visiting friends or heading off to the gym. DIRTY WORKS have thought of everything, with 'Get Set Go' a box set including 3x 100ml essential body products. All of these smell great and for £4.99 I think this is a great set to take on your travels. Next up is a fab idea by DIRTY WORKS A mini Brush travel kit with its own brush roll, are you very protective over your beloved Make-Up brushes and wouldn't run the risk of travelling with them? Then why not take a back up? 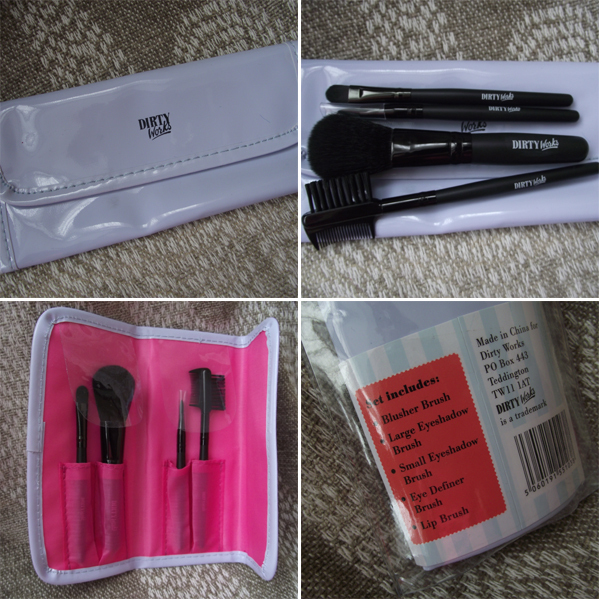 In this kit you are getting 4 brushes, I must admit they feel super soft and are no way scratchy like others. This set costs £6.99 which isn't to bad really. Have you been on your hols yet? If not would you pick up one of these sets? I hope you're all well and enjoying the warmer weather, have a lovely evening peeps. I really could have done with the "Get Set Go" this last week when I was away! Would have been perfect! Thanks for the review.